Atsuko Ishii, Planning Department, The ITU Association of Japan, Inc.
"A person is indispensable for any organization, who performs, so to speak, like a knowledgeable person that is very familiar with duties of the organization, and who is a lubricant existence about progress in the event held by the organization with outside organizations. In addition, administration of an organization having such kind of person goes very smoothly. Ms. Atsuko Ishii who appears here might be such a precious existence. I hope to expect her further activity." An annual event of the APSCC, the 7th Asia-Pacific Satellite Communication Conference & Exhibition, APSCC 2004 Satellite Conference & Exhibition was held on 3-4 September 2004 at Lotte Hotel Jamsil in Seoul, Korea. 53 speakers who are very high quality of senior level officers and professionals from satellite and space business arenas participate in the event. 254 participants of 112 companies and organizations from 19 countries attended the event. A meeting of the AIAA Technical Committee on Communications Systems (TCCS) was held on Wednesday, 15 September 2004 at Intelsat Headquarters, Washington, DC. 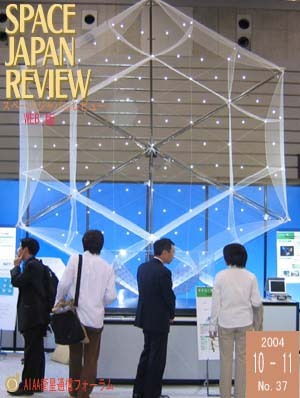 It was held in the microwave exhibition from November 10 to 12, 200‚S in Pacifico Yokohama. There is meaning, which shows how the exhibition parts combines in the system. Much people compare with the ordinary year look at exhibition this year. Connexion by BoeingSM is a high-speed mobile communications service that made its commercial debut in May 2004. It is authorized by the world's telecommunications agencies to operate as an airborne mobile satellite service (AMSS) using Ku-band satellite transponders in the 14 GHz to 14.5 GHz range of frequencies.